Cooling water is essential to many process systems. Evporative style cooling towers are utilized to remove the excess heat produced in process water systems and compressor operation. As with most cooling tower designs, warm water is pumped to a distribution system at the top of the tower. The water flows downward through a large porous fill while air is drawn up through it. More heat is discharged through the small amount of evaporation which occcurs. This is vented through the top of the tower with the assistance of the fan. The cooled water then drains to the bottom of the tower and is returned to the heat source. Control systems are customized to fit each client’s needs. The variable frequency drives (VFD) are programmed to cycle the cooling tower fans as needed allowing for a decrease in energy consumption. Soft-starters may be added to pumps to lower maintenance costs and increase the life of the pumps. Complete cooling system packages are available. 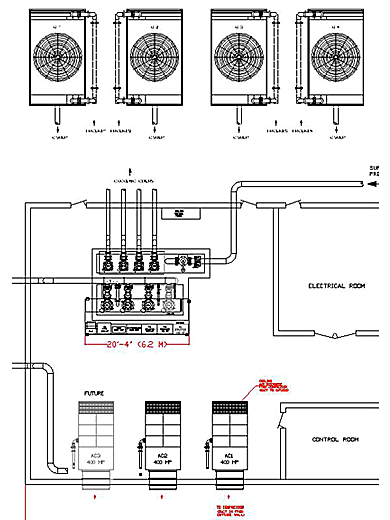 These include any combination of cooling towers, control panels, low pressure pumps, soft-starters, temperature transmitters, pressure transmitters and pressure gauges depending on system requirements. For all of these, we trust and use the high quality products from Evapco, ABB, Allen-Bradley, Grundfos, Flowserve, Benshaw and Wika.